It's one of the biggest tech funds in the world. And it's investing... fast. 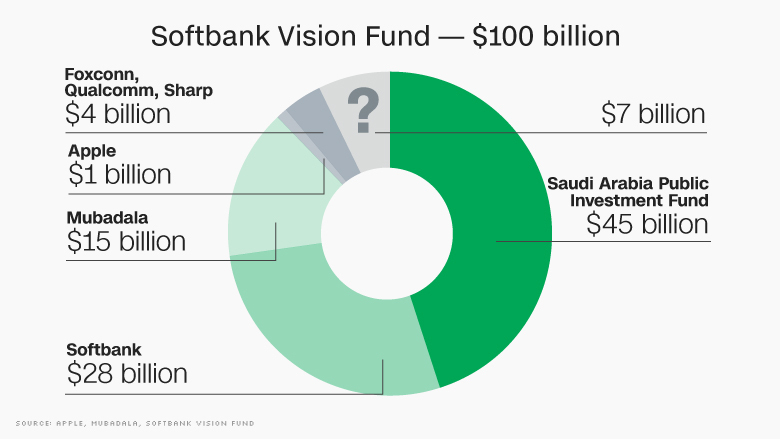 The Softbank Vision Fund was unveiled less than a year ago, backed by Saudi Arabia and Japan's SoftBank (SFTBF). By May it had raised $93 billion, out of a planned $100 billion, to spend on technology businesses of the future. Saudi Arabia is the biggest Vision Fund investor, followed by SoftBank. Other investors include Apple (AAPL), Qualcomm (QCOM), Foxconn, Sharp (SHCAY) and Mubadala, the sovereign wealth fund of the United Arab Emirates. The Vision Fund expects to raise the final $7 billion in the next month or so but it's wasting no time in putting the committed cash to work. It's already invested in 10 firms, leading funding rounds worth at least $7.7 billion. Slack: The company offers an online messaging service predominantly used by businesses to help employees communicate within teams and bypass long email chains. Slack now has a valuation of $5.1 billion. OYO: The Indian app helps users book budget hotels using their smartphones. It currently lists over 6,500 hotels in 198 cities across the country and describes itself as "India's largest hospitality company." Fanatics: A sports e-commerce company that sells licensed merchandise. It sells the official jerseys for teams on the NBA, NFL and European leagues. WeWork: The real estate company has made a name for itself as a coworking mecca, leasing buildings and turning them into collaborative work spaces for entrepreneurs. Roivant: A biotech firm that continues research on drugs that were no longer being developed by major pharmaceutical companies. Guardant Health: A cancer diagnostics start-up that can test for the disease through a single blood sample. Nvidia: A chip maker that is moving into developing artificial intelligence and self-driving technology. Volkswagen (VLKAY) and its Audi unit are among Nvidia's (NVDA) customers. Flipkart: The Indian e-commerce giant said the cash infusion, added to $1.4 billion raised earlier this year from Microsoft (MSFT), eBay (EBAY), and China's Tencent (TCEHY), leaves it with a $4 billion war chest for its battle with Amazon (AMZN). Brain Corp: The artificial intelligence company focuses on self-driving technology for robots. Plenty: An agriculture technology firm building indoor farms that are more efficient than traditional farms. Eric Schmidt and Jeff Bezos joined the Softbank Vision Fund's round of investment. ARM Holdings: ARM makes microchips that are used in smartphones designed by companies such as Apple and Samsung (SSNLF). It is the U.K.'s largest tech company. SoFi: SoFi is a lender that offers a short, but growing list of products including student loan refinancing, personal loans, mortgages and wealth management. Improbable: The British firm develops technology used in the creation of massive virtual worlds. 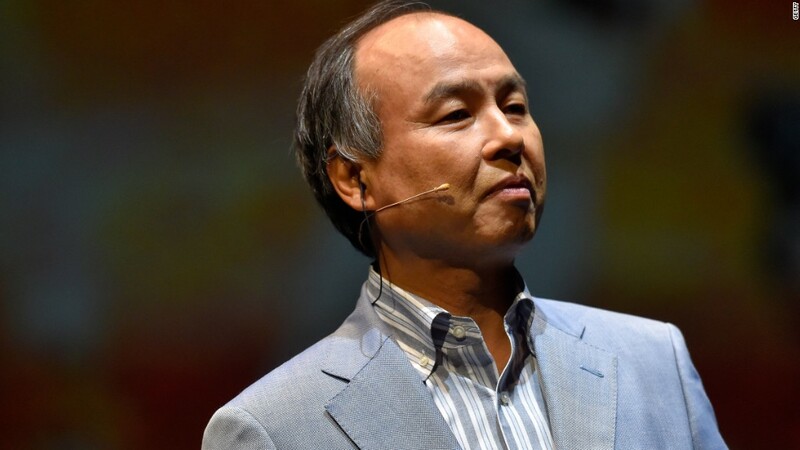 The investment round led by SoftBank values Improbable at more than $1 billion. Nauto: Nauto is autonomous vehicle technology company that uses cameras and motion sensors to make driving safer. It is working with partners such as Toyota (TM) and GM (GM) to develop technology for self-driving cars. OSIsoft: Software company that helps firms improve their operations by collecting, analyzing and visualizing large volumes of data in real time.